3 WONDERFUL Vintage BOWLING PINS Painted BLACK for Home Decor GREAT LOOK! THIS IS FOR THREE WONDERFUL VINTAGE BOWLING PINS THAT WERE PAINTED BLACK AT ONE TIME.. What a great look these have. Someone painted them black at one time, and they look great like this. They have scratches, scrapes and wear for a great look.. They would be great sitting on a shelf or in a cabinet. Measurements are about 15" tall by 4 /2" wide at the widest point each. They weigh a total of 10 pounds. THIS IS AN OLD SALVAGED ARCHITECTURAL BASE FROM AN OLD COLUMN THAT IS A NICE HARD TO FIND TALLER ONE OF 6 1/2" TALL. This is one of the best bases I have seen! This is an older wood column base in a nice size. This one has a nice shape and a nice size display area to set up a plant, statue or vignette on.. These are awesome to use as a display pedestal for a special item, or a plant as I show. Sorry, plant is not included. It has the old original white paint. It is chippy, with paint loss, crackly, peely paint, old dirt, stains and time worn for a great patina. There is an old crack, but it is very solid. A perfect way to add a touch of architectural interest to your room. Great in any shabby chic, Victorian, Antique, romantic cottage or French country home. Measurements are about 9 1/2" by 9 1/2" by 6 1/2" tall. It weighs about 5 pounds. THIS IS A FABULOUS OLD VINTAGE PLATEAU MIRROR, OR VANITY OR DRESSER DISPLAY MIRROR THAT HAS AN ORNATE METAL RIM AND VERY GHOSTY MIRROR THIS IS FOR THE MIRROR ONLY. THE FLOWERS ARE LISTED ON ANOTHER SHABBYTOWNUSA EBAY AUCTION THIS WEEK. This has a wonderful French look. This is an older mirror The metal has the old silver finish with tarnish, scratches, discoloration and wear for a great patina. It has four little feet and a nice ornate rim. The top of the mirror has a scalloped beveled cut. The mirror has lots of ghosting, streaking, silver loss, scratches, and wear. The mirror is not perfectly round. There is slight movement to the mirror from the rim, but it is solid. Everything looks better when displayed on a plateau mirror. Perfect for your shabby chic, Art Decor, Paris Apartment, French Country, or Cottage decor. Measurements are about 12 1/2" wide for the metal rim and feet. The mirror itself is about 9 1/2". It is about 1" tall and weighs about 2 pounds. HIS IS A SET OF THREE WHITE MARBLE STONE APPLES WITH METAL STEMS PLEASE NOTE THAT THESE ARE NOT OLD, AND ARE NEW WITH A NICE VINTAGE LOOK. These three apples are made of marble, or stone and are heavy for their size.. They have metal stems at the tops. There is one large apple and two smaller ones. There are some scratches, minor nics and wear. This would be wonderful in any shabby chic, romantic cottage, Farm House or French Country home. Measurements are about 4 1/2" tall by 4" wide for the large one. The smaller ones are about 4" tall by about 3 1/4" wide They weigh a total of 6 pounds. THIS IS AN AWESOME OLD VINTAGE WHITE METAL PLANT STAND OR PLANTER WITH TOLE FLOWERS This has such a great look. It is all metal with a nice round holder at the top and curvy legs. There are metal or tole flowers and roses at the bottom. It was painted white and is chippy, with paint loss, and wear for a great patina. Perfect anywhere in your home in your shabby chic, French country, Jeanne d Arch, Farmhouse, Paris Apt or romantic cottage decor. Measurements are about 22" tall by 15 1/2" wide at the top. The base is about 14" wide. It weighs about 10 pounds. THIS IS AN OLD VINTAGE FOLDING STEP LADDER WITH AN AWESOME LOOK WITH THE ORIGINAL OLD CHIPPY WHITE PAINT. THIS IS FOR THE LADDER ONLY. THE ITEMS ON IT ARE NOT INCLUDED BUT ARE FOR SALE ON OTHER EBAY AUCTIONS THIS WEEK. This is a very nice older well made step ladder with a great look! This one is so unique with extra details. It has the old original white paint that is crackly, chippy, with paint loss, and wear. It is very solid. These are awesome to use as a display pedestal for a special item, as I show. Great in any shabby chic, Victorian, Antique, romantic cottage or French country home. Measurements are from about 24" tall by 13" wide and 9" at the top. It weighs about 9 pounds. THIS IS FABULOUS! IT IS AN OLD VINTAGE HEAVY PLASTER STATUE OF THREE PRECIOUS CHERUBS OR CHILDREN HOLDING HANDS IN A CIRCLE This is made of plaster and is heavy weighing about 25 pounds. It is an old salvaged lamp base, and you can see in the back where the electrical wire was at one time. The three cherubs have pretty faces. The statue has the original creamy tan with white showing thru paint with chippy paint, paint loss, discoloration a couple minor chips , dirt and wear. Statues look awesome in any room and any d�cor or in the garden! Great in any shabby chic, Victorian, Antique, romantic cottage, Farm House or French country home. Measurements are about 24" tall by 10" by 10". It weighs about 25 pounds. THIS IS A WONDERFUL OLD VINTAGE CAST IRON METAL DOORSTOP WITH A BASKET OR URN OF FLOWERS. This is a little heavy weighing about 3 1/2 pounds. It is metal or cast iron metal. It is an urn or basket filled with flowers. It has white paint that is rusty, chippy, with paint loss, minor dirt and time worn. Perfect in any shabby chic, romantic cottage, Farmhouse, Jeanne d'Arc Living or French Country home either. Measures about 8 1/2" tall by 7" wide and 2 1/2" deep at the base. It weighs about 3 1/2 pounds. THIS IS AN OLD STREET SIGN THAT IS METAL THAT SAYS CHURCH ST. This is an older salvaged street sign. It says CHURCH ST. in black raised letters against the white background. It has an awesome patina with some rust, chippy paint, paint loss, crackly, scratches, some minor dings and wear. Perfect in your home or store in your shabby chic, French country, Farm House style, Paris Apt or romantic cottage decor. Measurements are about 24" long by 6" tall. THIS IS A FABULOUS STATUE OF MADONNA AND CHILD WITH A CHIPPY PATINA THAT IS PERFECT FOR YOUR HOME OR GARDEN DECOR DECOR. This is a newer statue that looks like it was made to look vintage with the time worn chippy paint. The colors are wonderful.. It is a nice size of 16" tall to display in your home or garden. It has a very nice French look to it. Perfect in any shabby chic, French cottage, Farmhouse, Garden, Flea Market d�cor or Jeanne d'Arc Living decor. Measurements are about 16" tall by 4" by 4". It weighs about 3 1/2 pounds. THIS IS FABULOUS! IT IS AN OLD VINTAGE CAST METAL CANDELABRA CANDLEHOLDER STAND WITH GREAT LOOK THAT WAS USED ON A CHURCH ALTAR. This came out of an older Church and was used on the altar to hold candles. It has five holders for candles. It is adjustable a little taller. It is a perfect size to use as a centerpiece on a table or mantle. It has very nice detailing. It has the old gold paint that is a little chippy, with paint loss and time worn for a great patina. Perfect in your home in your shabby chic, French country, Paris Apt or romantic cottage decor. Measurements are about 16" tall by 18" wide. The base is about 9" wide. It weighs about 3 1/2 pounds. HIS IS FOR THREE OLD VINTAGE SALVAGED ARCHITECTURAL POSTS OR COLUMNS THAT ARE NICE AND CHUNKY THAT WOULD MAKE FABULOUS CANDLEHOLDERS. These are different heights. They are older salvaged wood posts that are a nice thick size that have a nice shape. These are not the new reproduction ones. They were painted white and distressed for a great look. These would make great candle holders, as I show. Sorry, the candles are not included. A perfect way to add a touch of architectural interest to your room. Great in any shabby chic, Victorian, Antique, romantic cottage or French country home. Measurements are from about 13", 10" and 7 1/2" tall. They are 5" wide. They weigh a total of 9 pounds. THIS IS JUST GORGEOUS! IT IS AN OLD FRENCH WICKER BARBOLA BASKET WITH THE ORIGINAL GARLANDS AND SWAGS OF ROSES AND FLOWERS ALL AROUND AND THE ORIGINAL AQUA PAINT. This is an older wicker flower basket or waste basket . All around are barbola gesso garlands or swags of roses and flowers. There is a little missing detailing, as I show, and some old hairline cracks to the barbola, as I show, but it is solid. There are a couple minor breaks to the wicker, as I show. . THIS IS FOR THE BASKET ONLY. Measurements are about 12" tall by about 11" wide at top and 7" at the wood bottom. THIS IS A FABULOUS OLD VINTAGE STORE DISPLAY HANGING TORSO DRESS FORM OR MANNEQUIN WITH A SHABBY CHIPPY PATINA. PLEASE NOTE THE CONDITION OF THIS. IT IS A LITTLE ON THE SHABBY SIDE WITH LOTS OF CHIPPY PEELY PAINT FOR A GREAT LOOK. This has a very nice shape body of a woman. It is a molded composition of the front only, and can be hung or leaning against something. It is not free standing. There are a couple cracks or tears to the back where it was used to hang, as I show. It has lots of chippy paint, peely paint, crackling, dirt, minor stains and wear also, as I show. This has such a great look to it and would be perfect to display vintage rosaries, necklaces, crosses, crowns,and other jewelry. PLEASE NOTE~~~THIS IS FOR THE TORSO FORM ONLY. THE CROWN I SHOW ON IT IS NOT INCLUDED. Perfect to use in your home or shop. Perfect in your shabby chic, French country, Paris Apt, Jeanne d' Arc Living style, or romantic cottage decor. Measurements are about 21" tall by 16" wide at the shoulders by 6" deep. PLEASE SCROLL ALL THE WAY DOWN TO SEE ALL THE PHOTOS. BE SURE TO CHECK BACK ON SHABBYTOWNUSA AUCTIONS OFTEN! I LOVE THE OLD WEDDING CAKE TOPPERS AND HAVE A COLLECTION OF THEM MYSELF. THIS IS A COLLECTION OF FOUR VINTAGE WEDDING CAKE TOPPERS. Each of these are different and very pretty that are from the 40's and 50's. These are chalk ware and are hand painted. One has the bride and groom under an arch of flowers. They are standing on the top of the steps. The arch has the flowers and leaves in fabric. There is paint loss, wear, a few minor chips, stains and discoloration, as I show. One has the bride and the groom both in creamy white and they are standing on a heart base. The other two have the Grooms in black with the brides in her white gown. All have wear, discoloration, minor stains, minor chips, and paint loss Measurements are about 6 1/2" by 5 1/4" wide and 2" deep for the one with the arch. Measurements are about 4" tall each for the others without the arch. THIS IS AN AMAZING HEAVY OLD CAST IRON METAL DOORSTOP OR STATUE WITH A STANDING DOG OR FRENCH BULL DOG . This is a little heavy weighing about 10 pounds. It is an older piece of good quality that is metal or cast iron. The dog looks like a French Bull Dog and is standing up. It has the old paint that is chippy, with paint loss, crackling paint, minor dirt and time worn. Perfect in any shabby chic, romantic cottage, Farmhouse, Jeanne d'Arc Living or French Country home either. Measures about 9 1/2" tall by 9 1/2" wide and 4 1/2" deep. It weighs about 10 pounds. THIS IS AN OLD SALVAGED ARCHITECTURAL BASE FROM AN OLD COLUMN. This is a very nice base. This is an older wood column base in a nice small size. A little round mirror was added and is not removeable. These are awesome to use as a display pedestal for a special item, as I show. It has the old white paint that is chippy, with paint loss, crackly, peely paint, old dirt, stains and time worn for a great patina. A perfect way to add a touch of architectural interest to your room. Great in any shabby chic, Victorian, Antique, romantic cottage or French country home. Measurements are from about 7 3/4" by 7 3/4". It is about 2 1/2" tall. It weighs about one pound. THIS IS AN OLD VINTAGE ARCHITECTURAL SALVAGED CAST IRON GARDEN PIECE WITH A GREAT DESIGN AND PATINA . This is a great design. It has the old white paint with paint loss, a little rust, chippy, and wear for a great patina. I show a close up of the bottom, where a little bit of the metal has holes from the rust.. Perfect to add a touch of architectural interest in any shabby chic, Farm House, Jeanne d Arc Living,romantic cottage or French Country home. Measurements are about 22" by 27". It weighs about 4 pounds. I LOVE ADDING THE OLD ARCHITECTURAL PIECES TO MY HOME DECOR. THIS IS FABULOUS. IT IS AN OLD FRENCH CAST IRON SALVAGED ARCHITECTURAL CROSSS FRAGMENT DECOR PIECE WITH MARY OR MADONNA. . This is an older cast iron salvaged piece from France. This one is thick with an additional detail piece at the back. It has a fabulous old time worn patina that has the paint that is mostly rusty and chippy and crusty for a nice time worn patina. You could lean it against the wall, set it in an urn or on a shelf. It is not free standing. Great in any shabby chic, romantic cottage, Jeanne d'Arc, Farmhouse , Victorian or French country home. Measurements are about 11 1/2" tall by about 3 1/2" wide by 2" thick. It weighs about 4 pounds. HESE ARE FABULOUS! THEY ARE A PAIR OLD VINTAGE METAL CHERUBS OR ANGELS WITH WINGS. PLEASE NOTE THAT THESE ARE NOT FREE STANDING. THEY HAVE THE BOTTOMS OF SCREWS AT THE BOTTOMS, WHERE THEY WERE REMOVED FROM SOMETHING. The cherubs are made from metal. They have an awesome shape with stunning details They have the old gold paint that has discoloration, minor stains , paint loss and time worn for a perfect time worn patina. This would be wonderful in any shabby chic, romantic cottage, Farm House or French Country home. Measurements are about 9 1/2" by 3" wide at the wings for the angel. Together, they weigh about 2 pounds. THIS IS FABULOUS. IT IS AN OLD VINTAGE FRENCH LONG WOOD ROSARY OR NECKLACE WITH A CROSS WITH JESUS OR CRUCIFIX THAT IS A LITTLE OVER 4 FEET LONG. This has a great look and is 50" long. It has fancy and chunky wood beads with metal or wire pieces connecting them. At the bottom is a 3 1/2" long wood cross or crucifix with a metal Jesus. One of his arms is broken and that arm is not attached to the cross, as I show. There is also a little wood heart. There is writing on the back of the cross and heart. There is wear with some scratches, and discoloration. Perfect to display on a dress form or old statue. Measurements are about 50" long.. The wood beads are about 3/4" each. THIS IS AN EXQUISITE OLD VINTAGE FRENCH PICTURE FRAME WITH A LARGE BARBOLA GESSO FRAME AT THE TOP This is an old picture frame with a stunning barbola gesso double bow and ribbon at top and delicate beading along the inside of the frame. There is no glass. It has the old gold paint with discoloration, minor stains and wear for a fabulous patina. There is a little bit of chipped gesso in the corners, as I show. It has the old string hanger on the back. Perfect anywhere in your home with any shabby chic, French country or romantic cottage decor to add a touch of elegance. Measurements are about 12" by 15" for the outside. The opening is about 12" by 10"
THIS IS FOR A FABULOUS OLD BOOK CALLED BLACKIE'S GIRLS' ANNUAL WITH A BEAUTIFUL COVER THAT WOULD BE STUNNING IN A HOME DECOR. This is a hard cover book with a great cover. It has a woman holding a book on the cover. On the first page it is handwritten, To Flora From Aunt Dinah July 1925. It has beautiful stories and stunning pictures. I've taken a few photos of them. There are 176 pages. It is in good condition for it's age, with some yellowing, a little separation from the spine, fraying at the edges, minor dirt and minor wear. This would be perfect to display in your home on a table or on a shelf . Measurements are about 7 1/2" by 10" and 1 1/2" thick. THIS IS A BEAUTIFUL OLD VINTAGE PETIT POINT OF A WOMAN OR MAIDEN WEARING A CHIEF FEATHER HEADDRESS. This is such a rare find. I have never seen an old petit point or needlepoint like this. The beautiful woman is wearing a large chief's feather headdress. It is very well done with stunning colors. There are minor stains, minor dirt, fraying at the edges and wear. The fabric is glued to a cardboard backing. Measurements are about 14" by 9 1/4"
THESE ARE A PAIR OF GORGEOUS VINTAGE LITTLE GIRLS OR CHILDS DRESS UP SUNDAY CHURCH, GARDEN PARTY OR SPECIAL OCCASSION SHOES IN CREAMY WHITE WITH RHINESTONES These are so sweet! They have a gorgeous design at the fronts with rhinestones and pearls in pretty colors. They are creamy white patent leather. The insides say, Stuart's Miami Beach Fl, Dress ups by Alexis, Cellulose innersold There are stains, wear, as I show, dirt, scratches or scrapes as I show. One of the little stones is missing on one, as I show. They are slender shoes and have a wonderful French look to them! These would be wonderful in a display cabinet or on a dresser or vanity. Perfect anywhere in your home in your shabby chic, Jeanne d'Arc French country, Paris Apt or romantic cottage decor. Measurements are about 7 1/2" long by 2 1/2" wide. THIS IS FOR FIVE WONDERFUL OLD BOOKS WITH BEAUTIFUL COVERS THAT WOULD BE STUNNING IN A HOME DECOR. These are hard cover books. They are by Victor Hugo, Victor Hugo Works, Dramas, and History of a Crime. They are Vol 13 thru 17. There are black and white illustrations, Holland Paper Edition. The inside says these are number 244, Limited to 500 copies. There is a handwritten date of 1899. These books have the fabulous uncut sides on two sides of the pages that gives them an awesome look for display. Each cover is brown with nice gold lettering on the sides. There is fading, some discoloration , yellowing to some of the pages, wear and fraying on the covers, as I show. These would be perfect to display in your home on a table or on a shelf . Measures about 9" by 6" by 1 1/2" to 2" each. They weigh about 11 pounds total. THIS IS FABULOUS! IT IS AN OLD METAL FIRE BUCKET THAT CAN BE REPURPOSED AS A CONTAINER FOR FLOWERS OR OTHER ITEMS. What a great old bucket! It is thick and heavy. It has a handle that is connected with nice hardware on the sides. It has the old red paint with the writing on the front that says, FOR FIRE ONLY. The paint is chippy, with paint loss, some minor dings, dirt, a little bit of old cement and wear for a great look. Sorry, my plant is not included. This would be fabulous in any shabby chic, romantic cottage, Farm House or French Country home. Measurements are about 10 1/2" tall by 12" tall. It weighs about 6 pounds.. THIS IS FABULOUS! THIS IS AN OLD VINTAGE CAST METAL FRENCH URN, VASE OR PLANTER WITH A NICE TIME WORN PATINA. This is made from heavy cast iron metal and is from France. This one is so unique with the little peaks in the design. I haven't seen one like this before. It has an awesome shape with a slender shape and scalloped rim. It has the old gray or silver paint that has chippy paint, paint loss, some rust and time worn for a perfect time worn patina. Sorry, the flower is not included. This would be wonderful in any shabby chic, romantic cottage, Farm House or French Country home. Measurements are about 10" tall by 54" wide at the top. It weighs about 4 pounds. THIS IS BEAUTIFUL. THIS IS ONE CONTINUOUS PIECE OF OLD VINTAGE FRENCH METALLIC LACE TRIM. This is 4 yards long by about 2" wide with a stunning pattern. BE SURE TO SCROLL DOWN TO SEE ALL THE PICTURES I HAVE TAKEN. I TOOK LOTS OF PICTURES OF THIS! THIS IS A WONDERFUL OLD VINTAGE CHILD'S TOY TOW TRUCK WITH A CHIPPY RUSTY PATINA. This is all metal. It has the rubber wheels, with some missing or cracked pieces of rubber, as I show. It has part of the original label, which I can't make out, but looks like Richmond Scale Model Toy. It has the old red paint, but lots of it is rusty, crusty, with paint loss with chippy paint, some minor dings and wear, as I show. Such a charming display piece. Measurements are about 13 1/2" long by 5 1/2" by 4 1/2" tall. THIS IS AN OLD DEPARTMENT STORE WINDOW DISPLAY MANNEQUIN DRESS FORM OF A SHAPELY WOMAN WEARING THE ORIGINAL PINK DRESS. PLEASE NOTE THE CONDITION OF THIS PIECE BY VIEWING ALL THE PHOTOS. FEEL FREE TO ASK ANY ADDITIONAL QUESTIONS. THIS IS A RARE FIND, BUT THE CONDITION HAS CRACKS, MISSING ARMS, CHIPPY PAINT, DIRT AND WEAR. This came out of an old department store from the 1940's or early 1950's. The woman has a very shapely figure with a long elegant neck. Her face is hand painted. There is a little rust to a little metal piece, and a little hole at the top of her head. There are rusty screws at the bottom of her high heels, where it was original screwed into a base in the window display. She is missing her arms, there are several cracks, as I show, a few little chips, dirt, chippy paint, paint loss and wear. She is a little on the fragile side, but appears to be solid. She is not free standing. She is wearing the original pink dress, that has dirt, stains, a few minor tears and wear. Measurements are about 35" tall by about 9" wide at the arms and 4" deep. She weighs about 3 1/2 pounds. THIS IS A FABULOUS OLD VINTAGE TABLETOP, VANITY OR DRESSER DISPLAY MIRROR WITH ETCHING ON THE MIRROR. This has a wonderful French look. The mirror is beveled. There is beautiful etching on the two sides. The mirror itself has ghosting, silver loss, streaking and wear for a desirable look. There are felt pieces on the back to protect your furniture. Everything looks better when displayed on a plateau mirror. Perfect for your shabby chic, Art Decor, Paris Apartment, French Country, or Cottage decor. Measurements are about 23 1/2" by 12". It weighs about 5 1/2 pounds. THIS IS A FABULOUS OLD GLASS BOTTLE COVER WITH GREEN WICKER. This is an old ironing sprinkler bottle. It has a removeable metal sprinkler at the top that has some little dings. The bottle is glass and covered with wicker with the original old green, that is a little chippy and time worn.. Measurements are about 10" tall by 2 1/2" wide. THESE ARE 20 WONDERFUL VINTAGE CLEAR GLASS BOTTLES THAT ARE SMALL AND SOME OLD PERFUME BOTTLES. Bottles are so popular now and you see them in lots of the decorating magazines in the home decors. This auction is for all 20 bottles. They are different sizes and shapes and in small sizes. Some are old vintage perfume bottles. There are some stains, scratches, dirt and cloudiness to the glass bottles. Measurements are from about 3/4" to 2 1/2" tall each. OMG! THIS IS THE CUTEST LITTLE OLD BREAD BOARD I HAVE EVER SEEN! IT IS AN OLDER BREAD BOARD IN THE SHAPE OF A PIG IN TIME WORN PINK. I fell in love with this the minute I saw it. It is made from wood that is thinner than the new breadboards. It has some of the the original pink weathered paint, that is chippy with paint loss, knife marks and wear. How cute would this be on your counter or hanging on the wall. Someone added a hanger to the back at one time. Measurements are about 15 1/2" by 8" tall. THIS IS A VERY ORNATE SMALL WOOD CAPITAL THAT IS WOOD CARVED WITH AWESOME DETAILING. This is an older salvaged small salvaged capital of good quality with a fabulous design. It is made of wood It has the original old brown stain that is chippy, with paint loss, with some old dirt and time worn for a great patina. I show it with a candle, if you want to use it as an awesome candle holder. SORLRY, CANDLE NOT INCLUDED. Perfect to add a touch of architectural interest to your shabby chic, Jeanne d'Arc, French country, farm house decor or romantic cottage home. Measurements are about 3 3/4" by 3 1/4" tall. PLEASE ADD ME TO YOUR FAVORITES AND CHECK BACK OFTEN! THIS IS A FABULOUS VINTAGE PLATEAU FOOTED SILVERPLATE METAL TRAY WITH AN ORNATE RIM. This has a wonderful look. It is a vintage tray with 4 little feet. The design is just gorgeous with detailing all around on the scalloped rim that has flowers in the pattern.. At the bottom, there is a little opening underneath, that looks like this was a heating tray at one time. It has the original tarnished silver finish that is time worn, with discoloration and wear for a perfect patina. Perfect for your shabby chic, Art Decor, Paris Apartment, French Country, or Cottage decor. Measurements are about 15 1/2" wide by about 3" tall. It weighs about 3 pounds. THIS IS JUST FABULOUS! IT IS AN OLD CAST METAL IRON BASE AND SHADE WITH TOLE ROSES AND FLOWERS. This has such a great look! It is an old metal floor lamp and shade that was cut down to make this amazing tabletop piece. The base is very ornate and cast iron. The center metal column has tole roses and leave. The shade is removable and is very detailed with metal or tole flowers all around. Two sides have partially open areas on the lower halves. It has the original paint that is chippy, with paint loss, rusty, crusty and wear for a perfect patina. Measurements are about 21" tall by 9" wide. The base is about 8" by 8". It weighs about 16 pounds. THIS IS A WONDERFUL OLD METAL MOVIE PROJECTOR THAT IS RUSTY WITH A GREAT LOOK. This is metal and an older movie projector. It has the two reels with a piece of old movie film still there. There is a light bulb and a little motor. It is not in working order. The little handle at the back does not turn, due to being rusty. What a great accent piece to add to your home d�cor with a great look. Perfect to add a touch of vintage interest to your shabby chic, Jeanne d'Arc, French country, Farm House style or romantic cottage home. Measurements are about 18" tall by 14" by 5". It weighs about 6 pounds. THE VINTAGE CLOCKS AND CLOCK FACES ARE SO COLLECTIBLE RIGHT NOW. THESE ARE AWESOME.THEY ARE TWO DIFFERENT CLOCK FACES PLUS A CLIP ON CLOCK WITH A NICE FRENCH LOOK. What a great look these have! They are older pieces One clock face is enamel in a metal backing and the other metal or tin. The clock is a clip on or free standing by Phinney-Walker that has glass over the face and a couple minor dings. There is paint loss, scratches, chippy paint, dirt and wear, that just adds to the charm. Perfect in your home or garden in your shabby chic, French country, Farm house,Paris Apt or romantic cottage decor. Measurements are about 2 by 2 1/2" for the smallest to 6" wide for the round one. AWESOME Tall Old Vintage Wood Display STAND for Plant or Statue Crackly Chippy WHITE 26"
THIS IS FABULOUS! THIS IS AN OLD VINTAGE WOOD DISPLAY STAND THAT IS ABOUT 26" TALL. This has such a great look. It is all wood. The top is about 10 3/4" wide to hold a plant or statue. THE STATUE IS NOT INCLUDED OR FOR SALE. THE BUCKET IS LISTED ON ANOTHER SHABBYTOWNUSA EBAY AUCITON THIS WEEK. It has the original white paint that is chippy, crackly with paint loss, , and time worn for a perfect patina. This would be incredible in any shabby chic, romantic cottage, Farm House or French Country home. Measurements are about 25 3/4" tall. It is 10 3/4" wide at the top. It weighs about 3 1/2 pounds. HIS IS AN OLD VINTAGE ROUND CERAMIC OR PORCELAIN TILE WITH A FRENCH SCENE OF A MAN, WOMAN AND SHEEP THAT IS MADE IN ENGLAND. This is beautiful. It is a country side scene in the gardens with a romantic man, woman, and three sheep. There are a couple minor chips along the rim. It is signed in the front, but I can't make it out. The back is stamped, H & R Johnson, Made in England. Measurements are about 6" wide. THESE ARE JUST EXQUISITE. THESE ARE TABLE CANDELABRAS, CANDLE HOLDERS, OR GIRANDOLES WITH A GREAT LOOK. PLEASE NOTE THAT THESE ARE NOT ELECTRIFIED AND ARE JUST CANDLE HOLDERS These are older of good quality and a little heavy for their sizes The vintage candleholders like these always add a touch of elegance to a room. They have a very elegant shape and is a nice size. They hold two candles each, if you wanted to add candles. At the center tops are fancy finials. The bases have wonderful details with roses and flowers. They have the original silver finish. There is discoloration, and wear to the metal. There is a little rust to the metal screws. One is a little heavier than the other, and one has a piece of wood at the bottom underneath, as I show. There is some movement to the holders, they turn, but they are solid. Perfect for your shabby chic, romantic cottage, or French Chic home. THIS IS FABULOUS! THIS IS AN OLD CAST IRON METAL FLAT WALL HANGING URN WITH AN AWESOME SHAPE, AND DETAILS. This is very similar to the two I have hanging in my kitchen, and one of my favorite pieces. This is made from cast iron metal. It is a wonderful size, and very shapely, with nice detailing, including the fancy handles and roses and flowers at the top. I am not sure what this was salvaged from, or what it was part of, but it has an amazing look. SORRY, THE ITEMS IN THE BACKGROUND ARE NOT FOR SALE. It has the old silver or gray paint that has color variation, some scratches and time worn for a perfect patina. It would be fabulous hanging on your wall. It is not free standing. Don't let this one get away! This would be incredible in any shabby chic, romantic cottage, Farm House or French Country home. Sorry, the items inside are not included. Measurements are about 13" tall by 13" deep and about 1 1/2" deep at the deepest part. It weighs about 4 1/2 pounds. THIS IS A SET OF FIVE OLD VINTAGE METAL FRAMES WITH PRINTS OF PORTRAIT OF WOMEN. This was probably all connected as one piece at one time, but is now two pieces. One has two oval portraits and the other three. The frames are metal and they are covered with glass. Each frame has a portrait print of a beautiful women wearing a hat and flowers. There are stains to the prints, a minor tear on one and wear, as I show. Measurements are about 7" long for one and 4 1/2" long for the other. Each individual picture is about 2" by 3". THIS IS TWO OLD VINTAGE SALVAGED ARCHITECTURAL COLUMN TOPS WITH CAPITALS THAT CAN BE USED AS CANDLEHOLDERS, DISPLAY PEDESTALS OR PLANTERS WITH THE OLD CHIPPY WHITE AND BLACK PAINT. I absolutely love these! They are older salvaged wood columns that were cut down to about 12" tall. They are not the same size. One is about one inch shorter. They are wood and hollow inside, so you can use them as a vessel for a plant or dried hydrangeas, or as candleholders as I show. They have the old original white paint with black at the tops of the capitals with wear, chippy paint, crackly paint, paint loss for an awesome patina. There is no paint on part of the tops, and on the sides where they were removed from the banisters. A perfect way to add a touch of architectural interest to your room. Great in any shabby chic, Victorian, Antique, romantic cottage or French country home. Measurements are about 11 3/4" AND 12 3/4" tall each by 6 1/2" at the tops and 4 1/2" at the bottoms. THIS IS A GORGEOUS VINTAGE ITALIAN CREAMY WHITE PORCELAIN BASKET OR BOWL WITH A HANDLE AND PETITE PORCELAIN ROSES. This is Italian. It has a nice design with the open or rope design all around and petite roses on the rim all around. This is a larger hard to find piece. There is some surface crazing, teeny fleabite chips and a couple chips to the leaves and flowers as I show. Perfect anywhere in your home in your shabby chic, French country, Paris Apt, Jeanne d' Arc Living style, or romantic cottage decor. Measurements are about 7 1/2" wide by 6 1/2" tall. THIS IS AN OLD VINTAGE WOOD HAT STAND THAT IS PINK WITH A PAINTED WHITE FLOWER. THIS IS FOR THE HAT STAND ONLY. It has the original pink paint paint with the hand painted white flower and green leaves that is a little chippy, with paint loss and wear for a great patina. Perfect to hold a hat or veil, as I show. THIS IS FOR Measurements are about 9 1/2" tall by about 4" wide at the base. THIS IS FOR TWO SWEET OLD HYMN BOOKS CALLED GATHERED JEWELS AND HEAVENWARD FOR THE SUNDAY SCHOOL FROM THE 1800'S WITH BEAUTIFUL COVERS THAT WOULD BE STUNNING IN A HOME DECOR. These are both hard cover books that have lots of wear. Each cover is in tans, and neutrals with some black and brown lettering. Both have pages of beautiful Christian music. The inside of Gathered Jewels has some separation from the spine, as I show but is still intact. One is dated 1877, the other is missing the first few pages, so no dates.. There is fading, some discoloration to some of the pages, minor tears to the pages, wear and fraying on the cover and bent corners. There is a little piece of the back cover missing in the corner, as I show. These would be perfect to display in your home on a table or on a shelf . Measurements are about 7" by 5". THIS IS JUST DROP DEAD BEAUTIFUL. IT IS A HAND STITCHED QUILT WITH THE ROSE OF SHARON PATTERNIN GORGEOUS COLORS OF WHITE, PINK AND GREEN. I have had this quilt for years. I love this quilt in gorgeous colors. It is a good quality, well made piece. This was hand quilted by a very talented quilted . It is called Rose of Sharon, which is a very popular pattern. It is a medium weight with a light cotton batting in between. There are no holes or tears. There are a few minor light stains which are hard to find. One of the little appliqued flowers has white paint, as I show.The back is solid pink, and you can see fading along the edges, as I show. It is from a smoke free home. This would be beautiful in any cottage chic, French country, Americana, Farm House or shabby chic decor. It would be nice over a banister, an old wicker chair, on a bed or just displayed on a wall. Measurements are about 78" by 82". THE VINTAGE CLOCKS AND CLOCK FACES ARE SO COLLECTIBLE RIGHT NOW. THIS IS A WONDERFUL OLD DECORATIVE WOOD MANTLE CLOCK THAT IS NON WORKING. I love decorating with the old clocks. This has a nice French look. It has metal feet and a metal clock face with a glass door that opens, as I show. It has very nice detailing, including the six square columns with fancy metal columns and bases. There are little metal side handles. It has the original black paint that has chippy paint and wear. IT DOES NOT WORK. THERE ARE CLOCK PARTS ON THE INSIDE, AS I SHOW, BUT I DON'T KNOW IF IT IS ALL COMPLETE. I show a picture also of the little pendulum that I believe goes with it. Great in any shabby chic, Victorian, Antique, romantic cottage, Jeanne d'Arc Living, Farm house decor or French country home. Measurements are about 17" wide at the front feet by 10" tall and 6" deep. It weighs about 8 1/2 pounds. THIS IS AN OLD VINTAGE METAL OR TIN CABINET DISPENSER WITH A GLASS WINDOW AND A GREAT PATINA THAT CAN BE REPURPOSED AS A PLANTER IN YOUR HOME.. This has such a great look and would be awesome with a plant, or hydrangeas as I show. It is metal or tin with an opening at the top and bottom. At the front is a glass round window and a handle. I show how you can turn it both ways to display This probably came out of an old hoosier or kitchen cabinet that was a flour dispenser. It has the old white paint with discoloration, scratches, scrapes, rust and wear for a great patina. Measurements are about 13" tall by 12" by 9". It weighs about 3 pounds. SORRY, THE PLANT AND HYDRANGEAS ARE NOT INCLUDED. THIS IS FOR THREE OLD BOOKS THAT HAVE PRETTY COVERS WITH WOMEN THAT WOULD BE STUNNING IN A HOME DECOR. These are hard cover books. The titles and authors are: The Green Mouse by Robert W. Chambers, 1910, The Golden Horseshoe by Robert Aitken, 1907 and Nedra, by George Barr McCutcheon, 1905. The covers have women with very pretty faces. Two are wearing hats and one is a Mermaid holding a mirror. There is wear, stains, some lightly torn areas to the covers, minor fraying , fading, discoloration,and minor dirt for a nice time worn look. The Golden Horseshoe book has a minor red stain on the cover top, as I show. The only pictures are before the stories begin, as I show. These would be perfect to display in your home on a table or on a shelf . Measures about 7 1/2" by 5 1/4" by 1 1/2" thick. THIS IS FABULOUS. IT IS AN OLD VINTAGE METAL PINK WASTE BASKET OR CONTAINER WITH A SILHOUETTE OR PORTRAIT OF A WOMAN AND OTHER DETAILS. I love this! It is a metal can or waste basket with a gorgeous pink background. On the front and back in the oval is a woman portrait or silhouette, flowers, a bow and other ornate details in black. There are scratches, some paint loss, a few stains, rust and a few minor dings. The bottom is stamped Empeco. Perfect in your home or store in your shabby chic, French country, Farm House style, Paris Apt or romantic cottage decor. Measurements are about 10" by 10 3/4" by 8 1/2" wide at the bottom. It weighs about 1 pound. THIS IS A FABULOUS OLD VINTAGE DISPLAY MIRROR, OR VANITY OR DRESSER DISPLAY MIRROR THAT IS ETCHED AND BEVELED. THIS IS FOR THE MIRROR ONLY. This has a wonderful French look. It is older with a nice oval shape. It has a bevel and a very pretty etched design. The mirror has ghosting, silver loss, scratches, spotting and wear. THIS IS FOR THE MIRROR ONLY. The items on it are not included Everything looks better when displayed on a mirror. Perfect for your shabby chic, Art Decor, Paris Apartment, French Country, or Cottage decor. Measurements are about 19" by 11 3/4". HESE ARE THREE OLD VINTAGE METAL FLOWER POTS AND STANDS WITH A GREAT LOOK. These are old, and not reproductions. They are loaded with charm and with so many possibilities. There are the three rounded bottom metal pots and each has a metal three legged stand that they fit in. I show them with little Christmas Trees, sorry, those are not included and not for sale. There is some rust, old black paint, chippiness, paint loss, some discoloration, scratches and wear for a great look. Measurements are about 3 3/4" tall by 3 1/4" wide at the tops and 2 1/2" wide at the bottoms. THIS IS A SWEET LITTLE OLD VINTAGE ITALIAN TOLE TOWEL OR JEWELRY HOLDER STAND WITH WHITE ROSES. This has two arms to hold small guest finger towels or hanging necklaces. There are white roses and green leaves. It has the old paint in gorgeous colors of green and white that is a little chippy and time worn for a great patina. The twining branch of leaves has a little movement where it is separated from the stand, but it is on solid. Perfect in your home in your shabby chic, French country, Paris Apt or romantic cottage decor. Measurements are about 15 1/2" tall by about 12" arm to arm. The base is about 7" wide. THIS IS JUST BEAUTIFUL. IT IS A GORGEOUS HAND STITCHED QUILT WITH A GREAT PATTERN AND IN PINK AND WHITE. I love this quilt in pink and white. This was hand quilted by a very talented quilter. It is a medium weight with a light cotton batting in between. There are no holes or tears. There is one small block that can come unstitched about an inch, as I show. There are some small stains which I also show close ups with a penny for size comparison. I did not wash it. Overall, I think this is in good condition. It is from a smoke free home. This would be beautiful in any cottage chic, French country, Americana, or shabby chic decor. It would be nice over a banister, an old wicker chair, on a bed or just displayed on a wall. Measurements are about 63" by 76". THIS IS AN OLD ANTIQUE VINTAGE WOOD HAT STAND THAT IS VERY UNIQUE WITH A LETTER g. THIS IS FOR THE HAT STAND ONLY. THE PINK HAT I SHOW WITH THIS IS NOT INCLUDED. This is an older hat stand with a nice base and holder. It has a carved letter G on it in a circle. It is straight, but I took the pictures crooked! It has the original creamy white paint with gold highlights that is a little chippy, with paint loss and wear for a great patina. Perfect to hold a hat or veil, as I show. THIS IS FOR THE HAT STAND ONLY. Measurements are about 8 1/2" tall by about 5 1/4" wide at the base. THIS IS FOR THE HAT ONLY. THE STAND IS NOT INCLUDED. WHAT A BEAUTIFL VINTAGE PINK HAT. THE HAT STAND IS NOT INCLUDED, BUT FOR SALE ON ANOTHER EBAY AUCTION THIS WEEK. This hat is a gorgeous shade of pink with pink netting or net all around. There is a single large pink rose or flower, that is a little floppy. it has a label that says Frederics Millinery, Allentown. There are minor stains, and wear. Measurements are about 9" by 9" by 6". THIS IS JUST GORGEOUS WITH A NICE FRENCH LOOK! IT IS AN OLD 26" TALL WICKER BARBOLA BASKET WITH THE ORIGINAL GARLANDS AND SWAGS OF ROSES ALL AROUND This is an older wicker flower basket stand.This is an old wedding basket that was used to hold the flowers at a wedding. All around are thick barbola garlands or swags of roses and flowers. There are also flowers and roses at the base, which you don't find very often. It has the old white paint that is chippy, with paint loss and time worn for a great look. There is a little missing barbola and some old hairline surface cracks. Sorry, the hydrangeas are not included and not for sale. Measurements are about 26" tall by about 12" wide. It weighs about 2 1/2 pounds. THIS IS FABULOUS WITH A NICE FRENCH LOOK! IT IS AN OLD WICKER SHOPPING CART BASKET . These are getting so hard to find in this good condition. It has a message on the bottom with a date of 1941, as I show. it has a wood handle and two wheels. There is some missing rubber on one of the wheels as I show. There are a couple minor breaks to the wicker, as I show. It has the original stain with some chippy paint , minor stains for a nice time worn patina. THIS IS FOR THE SHOPPING CART ONLY, SORRY, MY HYDRANGEAS ARE NOT INCLUDED AND NOT FOR SALE. Measurements are about 35' to the top of the handle by about 15" wide and 13" deep. it weighs about 5 pounds. THIS IS INCREDIBLE! THIS IS AN OLD VINTAGE CAST IRON GARDEN URN WITH AN AWESOME SHAPE, AND THE OLD WHITE PAINT WITH A WONDERFUL PATINA. THIS IS FOR THE URN ONLY. THE ROSES ARE NOT INCLUDED, . Urns always add a nice architectural interest to a room or garden. This is made from heavy cast iron metal. It is a nice smaller size with a nice shape. It has the old white paint that is chippy, with paint loss, peely, crusty, a little rusty, rust inside and time worn for a perfect time worn patina. You can use this in your home with flowers or a plant, or fill it with shells, beaded domes, roses or whatever you wanted to. This would be incredible in any shabby chic, romantic cottage, Farm House or French Country home. Sorry, the items inside are not included. Measurements are about 7 1/2" tall. It is 8 1/2" by 7 1/2" The opening is about 7". It weighs 4 pounds. THIS IS FOR THREE SWEET OLD BOOKS CALLED SPRING FLOWERS PAINTING BOOK, HAPPY DAYS A SHAKESPEARE BIRTHDAY BOOK AND GLEAMS OF LIGHT WITH BEAUTIFUL COVERS THAT WOULD BE STUNNING IN A HOME DECOR. Each cover is beautiful with nice lettering, and nice pictures. Spring Blossoms is an old painting book that has the outline pages mostly color penciled in nicely, as I show. The Birthday book has more wear on the cover than the others. It has nice colored pictures and hand written names and birthdays. The Gleams of Light is by Frances Ridley Havergal book has beautiful color flowers and Bible scriptures. There is fading, some discoloration to some of the pages, some stains, minor wear and fraying on the cover and bent corners. The birthday book has some separation from the spine. This would be perfect to display in your home on a table or on a shelf . Measures about 7" by 5 1/2", 6" by 6 1/2" and 4" by 5 1/2". THIS IS FABULOUS! 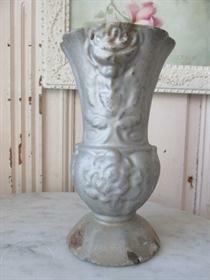 THIS IS AN OLD VINTAGE CAST METAL FRENCH URN, VASE OR PLANTER WITH A NICE TIME WORN PATINA. This is made from heavy cast iron metal . It has an awesome shape with a slender shape and scalloped rim. It has a nice design on the front and back. It has the old gray or silver paint that has chippy paint, paint loss, some rust and time worn for a perfect time worn patina. It is rusty inside. This would be wonderful in any shabby chic, romantic cottage, Farm House or French Country home. Measurements are about 7 3/4" tall by 4" wide at the top. It weighs about 2 1/2 pounds. THIS IS AN OLD ANTIQUE VINTAGE WOOD HAT STAND THAT IS 23" TALL. THIS IS FOR THE HAT STAND ONLY. THE BRIDAL CROWN AND VEIL I SHOW WITH THIS IS FOR SALE ON ANOTHER SHABBYTOWNUSA EBAY AUCTION THIS WEEK. This is an older hat stand with a nice base and holder. It has the original stain that is a little chippy, with paint loss and wear for a great patina. Perfect to hold a hat or veil, as I show. Measurements are about 23" tall by about 5" wide at the bottom and 4 3/4" wide at the top. It weighs about 1 pound. THIS IS AN EXQUISITE OLD ANTIQUE ROSE OIL PAINTING OF PINK ROSES THAT IS PAINTED ON A WHITE GLASS PLATE. This could very easily be a keeper if I had room for just one more! This is an older painting that is painted on a round white glass plate that is very well painted. This is a Sunday afternoon painting from the Victorian era. The colors are beautiful with the gorgeous pink roses and green leaves. There is some minor paint loss and wear. There is a teeny tiny chip on the edge of the plate. This would be stunning alone or on a wall of old rose paintings in any shabby chic, romantic cottage or French Country home. You would need to get a plate hanger if you are hanging it, or you can set it up on an easle. Measurements are about 13 1/2". THESE ARE WONDERFUL! THEY ARE SIX VINTAGE BOTANICAL DRIED PRESSED FLOWERS AND LEAVES FROM 1975 THAT WOULD BE AWESOME IN YOUR HOME DECOR. Each pressed flower with leaves is against a creamy white board with plastic over them. The boards have some discoloration, minor dirt and minor stains. There are a few tiny leaves that are loose. The colors are wonderful. The backs have the hand written information about each one with the dates of 1975 on them and the names of the collectors, B. Carlson and R. Yoder. Some of the flowers are Wild Bergamot, Woodland Sunflower, Hydrophyllum, Rabbitbrush, Horsemint and Alyssum Perfect in your shabby chic, French country, Farmhouse or romantic cottage decor. Measurements are about 9" by 12" each. HIS IS A FABULOUS OLD METAL FRENCH GARDEN FLOWER HOLDER, GARDEN STAKE OR PLANTER. This is older and of good quality. These were used in the old cemeteries and gardens in France to hold flowers. This is cast iron with a wonderful scalloped top and stake at the bottom to stick in the ground, if you wanted to stand up in the garden. It has an awesome time worn patina with the old paint, with paint loss, with chippy paint, some rust, some stains and dirt with wear. You could use it in a garden, or just set on a table with some roses or flowers. You can stand it up with the scalloped rim at the bottom, or lay it down to just add a touch of architectural interest. Measurements are about 10" long including the stake by about 5". It weighs about 3 pounds. THIS IS A FABULOUS OLD VINTAGE METAL WIRE BASKET WITH A GREAT LOOK! This is an older basket in a nice large size. It has handles the fold down. It has the original paint, with paint loss chippy paint, a little rust and wear There are so many uses for this. You could use in a bathroom with towels, as a laundry basket, filled with dried hydrangeas or flowers, for magazines and so much more. Measurements are about 19 1/2" long by 14" wide and 10" tall. It weighs about 4pounds. THIS IS A SWEET OLD VINTAGE MIRROR, THAT YOU CAN HANG OR USE AS A PLATEAU DISPLAY MIRROR. The mirror is older with a small bevel . These is a nice little etching design all around. The mirror has ghosting, silver loss, some scratches, and wear. There is a wire plate hanger on the back, where it was hung on a wall, you can remove the wire . Perfect for your shabby chic, Art Decor, Paris Apartment, French Country, or Cottage decor. Measurements are about 9 1/2" wide. THIS IS A GORGEOUS OLD VINTAGE Embossed METAL PICTURE FRAME WITH BEAUTIFUL PINK RHINESTONES IN THE DESIGN. This is such a nice size frame . It is an older frame of good quality. It has a stunning metal embossed design of flowers and leaves. At the centers of the four flowers are beautiful large pink oval rhinestones. The opening is oval. It is covered with glass.. There is some discoloration to the frame, some minor dings to the tin metal and some unevenness along the oval opening and edges. There is a wire hanging at the back. It is not free standing. Perfect in your shabby chic, French country or romantic cottage decor. Measurements are about 8" by 6 1/2". The opening is about 3 1/2" by 5". THESE ARE JUST EXQUISITE AND SUCH A RARE FIND. THEY ARE THREE SEPARATE LITTLE OLD VINTAGE GLASS DOMES WITH WAX FLOWERS INSIDE. Wow! What a rare find. These were each wrapped in old newspaper with a date 0f 1943. They are small glass domes that fit over the wood bases. On the bases are little wax flowers, and fabric leaves. The roses are a blush pink and so pretty. They have become detached from the bases. You can feel the wax on the flowers. The domes just fit over the wood bases. There are minor stains and wear. Measurements are about 5 1/2" tall by 2 1/2" wide at the base each. THIS IS JUST GORGEOUS! THIS IS A PAIR OF DRAPERY, DRAPES OR CURTAIN PANELS WITH A BEAUTIFUL WHITE BACKGROUND AND PATTERN OF PINK AND WHITE ROSES AND OTHER FLOWERS. This is two drapery panels of a medium weight fabric that I believe is cotton. They are a nubby or textured fabric. It has a white background with the most gorgeous clusters of pink and white roses and flowers of soft yellow and blue with green leaves. Both have 5 pleats at the tops. There are a few minor light stains. . Perfect in your shabby chic, French country or romantic cottage home. Measurements are about 62" long plus a 3" hem each by 44" wide at the bottoms and 24" wide at the tops. THIS IS A FABULOUS WOOD STOOL OR LITTLE BENCH WITH THE ORIGINAL PINK PAINT AND A NICE TIME WORN PATINA. I can think of so many possibilities for this. It is wood. You can use it as a riser to set up a vignette, or to hold a statue or plants. It is such a cute shape and size! It has the original pink paint that is now chippy, peely, minor dirt and time worn with paint loss for a perfect patina. There are a couple little chips of wood at the feet. THIS IS FOR THE PINK STOOL ONLY. THAT IS ONE OF OUR NEW LITTLE KITTENS, CALI THAT CLIMBED UP TO GET IN THE PICTURES, AND SHE IS NOT INCLUDED. Measurements are about 27" by 11 1/2" by 15" tall. It weighs about 15 pounds. THIS IS A FABULOUS OLD VINTAGE WOOD BREAD BOARD OR CUTTING BOARD IN A NICE SIZE AND A GREAT LOOK. This is an old vintage cutting board, not a reproduction. It has a handle with a hole to hang up in your kitchen or dining room. it has knife cuts, scrapes, minor stains and wear for a fabulous patina. Measurements are about 13 1/2" by 24" with the handle and 1" thick. It weighs about 4 pounds. THESE ARE FOUR FABULOUS OLD VINTAGE WHITE MARBLE STONE LETTERS THAT SPELL THE WORK CATS. These are four separate letters that are free standing. Each letter is made from white marble. They say Italy with numbers. There are minor scratches, tiny fleabite chips, discoloration, stains, dirt and wear for a great look. Perfect in your home or store in your shabby chic, French country, Farm House style, Paris Apt or romantic cottage decor. Measurements are about 4" tall by 2 1/4" to 2 1/2" wide by 1 3/4" deep for each letter. They weigh a total of 3 pounds. THIS IS A COLLECTION OF SIX FABULOUS OLD VINTAGE METAL FLOWERS ON CURVY CURLY LONG STEMS WITH A GREAT PATINA These are so unique with an awesome look. They are six individual pieces. Each flower has an 8" long curvy stem. They are all metal with paint loss, with color variation, rusty, some dings and wear for a great patina. These would be fabulous and add a touch of garden architectural interest in any shabby chic, Farm House, Jeanne d Arc Living, romantic cottage or French Country home. Measurements are about 27" tall by 17 wide and 6" deep. It weighs about 3 pounds. THIS IS FOR THE SIX METAL FLOWERS ONLY. THIS IS ON AN OLD VINTAGE TRINKET, VANITY OR JEWELRY BOX WITH BARBOLA GESSO FLOWERS AND OTHER DETAILS ON TOP AND ALL AROUND. This is a very unique old wood box with barbola gesso details that is older from the early 1930's. It has two rows of flowers and leaves on the lip and more details all around. It has a metal latch on the lid that lifts up. inside it is lined with black velvet. There is some chippiness to the black paint, as I show along the inside edges. It has the original gold and brown paint. There is chippy paint, paint loss. hairline surface cracks, minor dirt, a little missing barbola and wear. I show a close up on the lower right side of the box, where there is a 1 1/2" missing piece at the bottom. Measurements are about 12" by 7" by 3". it weighs about 2 1/2 pounds. THIS IS A SWEET LITTLE OLD VINTAGE OIL PAINTING ON WOOD OF A VASE OF PINK FLOWERS. This is well painted with such pretty colors. There is a blue vase filled with the prettiest pink flowers. There are minor scratches, paint loss and wear. There are no dates or signatures. There is a hanger on the back. This would be stunning alone or on a wall of old floral paintings in any shabby chic, romantic cottage, Farm House or French Country home. Measurements are about 8" by 7 3/4"
THIS IS A FABULOUS OLD VINTAGE PLATEAU MIRROR, OR VANITY OR DRESSER DISPLAY MIRROR THAT HAS 5 ORNATE METAL FEET IN A NICE LARGE SIZE. This has a wonderful French look. The gold metal has tarnish, scratches, discoloration and wear for a great patina. The mirror is beveled . The mirror has ghosting, silver loss, some scratches, and wear. The bottom has metal that is rusty, as I show. THIS IS FOR THE MIRROR ONLY. The items on it are not included but ARE FOR SALE ON OTHER SHABBYTOWNUSA AUCTIONS THIS WEEK. Everything looks better when displayed on a plateau mirror. Perfect for your shabby chic, Art Decor, Paris Apartment, French Country, or Cottage decor. Measurements are about 12" wide and 1 1/4" tall. It weighs about 4 pounds. THIS IS JUST GORGEOUS! I LOVE THE OLD MERCURY GLASS PIECES LIKE THIS. IT IS AN OLDER MERCURY GLASS OR MIRRORED TIE BACK OR HANDLE PLEASE NOTE, the little screw at the back that was used to tie this into the wall is missing. These are so hard to find. It is older and of good quality. It is a little heavy for it's size. The front has a nice fancy embossed like design. There is silver loss, ghosting, and wear. Again, the screw at the back is missing. This would be beautiful in any shabby chic, romantic cottage or French Country home. Measures about 3 3/4" wide by 3 3/4" deep. THIS IS FOR FIVE PIECES, THESE ARE VINTAGE ITALIAN CREAMY WHITE PORCELAIN LITTLE DISHES WITH PETITE PORCELAIN ROSES. These are Italian. They all have a nice design with the open or rope design all around and petite pink porcelain roses and green leaves. There is some surface crazing, teeny fleabite chips and a couple very minor chips. Perfect anywhere in your home in your shabby chic, French country, Paris Apt, Jeanne d' Arc Living style, or romantic cottage decor. Measurements are about 3" to 4" by about 1 1/4" tall each. HIS IS AN EXQUISITE OLD VINTAGE WALL FRAME WITH BARBOLA GESSO DETAILS ALL AROUND . This is such a nice size wall frame. It is older and of good quality. The frame is wood with gesso. It is very ornate with lots of gorgeous detailing all around. It has the original paint. The frame has a gorgeous creamy white with soft gold color that is chippy, paint crackling,with color variation, with paint loss, scratches and wear. There are some minor hairline surface cracks but it is solid. It can be displayed vertically or horizontally. Perfect in your shabby chic, French country or romantic cottage decor. Measurements are about 26 1/4" by 26 1/4". The opening is about 20" by 20". It weighs about 5 pounds. HIS IS A GORGEOUS OLD VINTAGE PAINTING OF PINK ROSES ON A WHITE GLASS PLATE. This is so pretty. It is an older painting with gorgeous colors on a curved glass plate. There is chippy paint, paint loss, scratches minor dirt and wear. You would need a plate hanger if you are going to hang this. Measurements are about 10" wide by 1 1/2" tall. THESE ARE FABULOUS AND SUCH A RARE FIND. THEY ARE TWO OLD TIERED HANGING PENDANTS OR PINS THAT SAY SONS OF COLUMBUS OF A. They have pins on the backs. There is discoloration, wear, minor dirt and on the Pres. Arbitration label, a little unevenness. Each pendant or pin is metal and tin with the enamel portrait of Columbus at the center. One says Attendant and the other Pres. Arbitration, and the top pieces say Sons of Columbus of A. Measurements are about 4" long by 2 1/4" wide each. BE SURE TO SCROLL DOWN TO SEE ALL THE PICTURES I HAVE TAKEN. 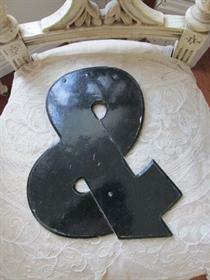 THIS IS A WONDERFUL OLD VINTAGE SYMBOL OR LETTER "&" THAT WOULD BE FABULOUS ON A WALL. This is an older "and" symbol that is particle board. It has the old black paint, that is a little chippy, with paint loss, scratches and wear for a nice patina. This would look fabulous in a white decorated room. A hanger was added if you want to hang. Measurements are about 10 1/4" tall by 8" wide. OH MY GOSH! THIS IS JUST GORGEOUS! THIS IS AN OLD WOOD 8 SIDED PLAQUE OR WALL HANGING WITH A VASE OF THICK BARBOLA GESSO PINK ROSES. This is so unique! It is an older piece of good quality. It is all wood with the original barbola gesso roses that are breathtaking and thick. It has a very nice French look to it. It is the original paint that is chippy, with paint loss and wear. There are some old hairline cracks, but it is solid. There is a hanger on the back. Measurements are about 12" by 12" by 1"
THIS IS FOR TWO PIECES, A GORGEOUS VINTAGE ITALIAN CREAMY WHITE PORCELAIN HEART SHAPED BASKET WITH A HANDLE AND A TALL VASE, BOTH WITH PETITE PORCELAIN ROSES These are Italian. The basket is heart shape with a handle. It has a nice design with the open or rope design all around and two pink porcelain roses. The other is a elegant tall vase with pink roses and green leaves all around. There is some surface crazing, teeny fleabite chips and a couple very minor chips. Perfect anywhere in your home in your shabby chic, French country, Paris Apt, Jeanne d' Arc Living style, or romantic cottage decor. Measurements are about 7" by 6 3/4" by 5" tall for the heart shape basket. The vase is about 7 1/4" tall by 4" wide at the top. THESE ARE JUST FABULOUS! THIS IS A PAIR OF WOOD CANDLE HOLDERS WITH BARBOLA GESSO ROSES, FLOWERS AND FRUIT ALL AROUND. 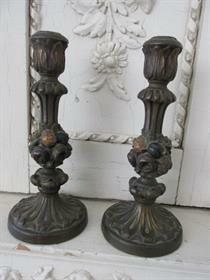 This is a pair of older candle holders of very good quality. They are so shapely and very ornate with stunning details and a nice French Look. It has the original dark paint or stain, with touches of accent colors to the detailing. There are some minor scratches and wear for a nice time worn patina. They have a wonderful French look to them. You can add a candle or just add as is to your collection of barbola collectibles. 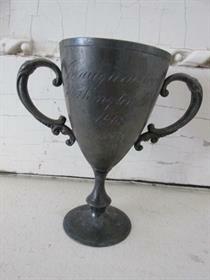 THIS IS A SWEET LITTLE VINTAGE TROPHY LOVING CUP WITH A DATE OF 1925. This is a nice small size trophy with a nice shape and handles. It is tiny, only 3 1/2" tall. The front says Miss East High, 1925. There is tarnish, discoloration, scratches, and wear for a great look. It is not perfectly round at the top. Perfect to use as a little vase. Trophies look great in any decor either alone or grouped together. Measurements are about 3 1/2" tall by 3 1/4" wide handle to handle and 1 3/4" deep. THIS IS FABULOUS. 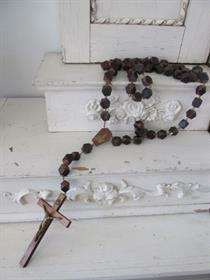 IT IS AN OLD VINTAGE FRENCH LONG WOOD ROSARY OR NECKLACE WITH A CROSS WITH JESUS OR CRUCIFIX THAT IS ALMOST 5 FEET LONG. This has a great look and is 58" long. It has fancy and chunky wood beads with metal or wire pieces connecting them. At the bottom is a 7 1/2" long wood cross or crucifix with a metal Jesus. There is wear with some scratches, and a little white paint on a couple beads. Perfect to display on a dress form or old statue. Measurements are about 58" long, almost 5 feet long. The cross is about 7" long. The wood beads are about 1" each. THIS IS A FABULOUS VINTAGE CAST METAL TRIVET WITH AN ORNATE PATTERN This is cast metal or cast iron and has a nice design. It has four little feet. It has the original black paint that is a little chippy, with a little paint loss, t and time worn for a perfect patina. It is not perfectly flat. The plateau mirror is for sale on another shabbytownusa ebay auction this week. Measurements are about 7 1/2" by 3/4" tall.. It weighs about one pound. Perfect anywhere in your home in your shabby chic, French country, Paris Apt or romantic cottage decor. THIS IS FABULOUS AND SO UNIQUE. 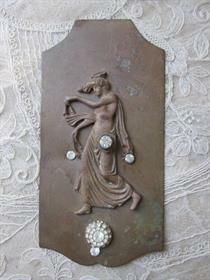 IT IS A SALVAGED METAL PIECE WITH A BEAUTIFUL WOMAN OR GODDESS WITH SOME EMBELLISHED RHINESTONES. This is an older piece. I am not sure what it came off of. There is a woman standing in a nice pose on the metal back plate. Some old rhinestones were added to add an elegant touch The metal has some discoloration, wear, and minor marks for a great patina. This would be stunning leaning on a shelf. It is not freestanding. Measurements are about 6 3/4" tall by about 3 1/4" wide. WHAT A GORGEOUS COLLECTION OF SIX OLD VINTAGE PINK MILLINERY FABRIC ROSES! PLEASE NOTE THAT THESE ARE FLOPPY OF SMASHED DOWN A LITTLE. They have the stems that are wrapped with some of the wrapping tape worn off. Some have leaves. The roses are soft floppy linen or silk like petals with some velvet petals. They are soft, and might open up more with some steam. There are minor stains and wear. It is so hard to find these gorgeous shades of pink and peachy pink. They would look so pretty on a vanity, to dress up a dress form or statue, in a glass case, or just sitting a couple around to add a touch of romance in your shabby chic, French cottage, Victorian or romantic cottage d�cor. Measurements are about 3" to 4" for the roses only. The stems are about 4" long each. THE VINTAGE CLOCKS AND CLOCK FACES ARE SO COLLECTIBLE RIGHT NOW. 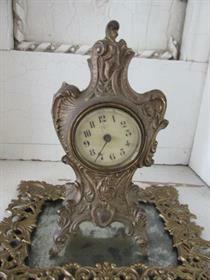 THIS IS A WONDERFUL OLD ANTIQUE 1891 DECORATIVE METAL CLOCK THAT IS NON WORKING. I love decorating with the old clocks. This has a nice French look. It is footed, standing on four feet with a nice ornate shape. The clock face is not perfectly face, and has a glass cover. You probably could straighten it and get the 12 at the top. The back has the patent date of Jan. 13, 1891. It has the original gold paint with paint loss, chippy paint, scratches and wear. IT DOES NOT WORK. THIS IS FOR THE CLOCK ONLY. Great in any shabby chic, Victorian, Antique, romantic cottage, Farm house decor or French country home. Measurements are about 7 1/4" tall by 3 1/4" wide at the bottom by 2 1/2" deep. 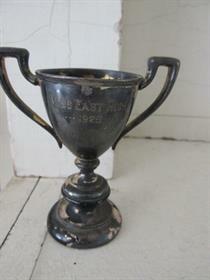 THIS IS A FABULOUS OLD VINTAGE TROPHY LOVING CUP WITH A DATE OF 1905. This is a nice small size trophy with a nice shape with fancy handles. The front says INAUGURATION WASHINGTON D.C. 1905. This was the year that Theodore Teddy Roosevelt became president, so this appears to be a souvenir during the Presidential inauguration. There is tarnish, discoloration, scratches, and wear for a great look. The top is not perfectly round and it leans ever so slightly to the left. What a great collectible trophy to add to your collection, or add to your decor as a little vase. Trophies look great in any decor either alone or grouped together. Measurements are about 4 1/4" tall by 4 1/4" wide handle to handle and 2 1/4" deep. THIS IS TWO GORGEOUS VINTAGE ITALIAN CREAMY WHITE PORCELAIN PIECES. THERE IS A DISH OR BOWL AND A BASKET WITH THE NICE OPEN ROPE PATTERN AND PETITE PORCELAIN ROSES These are Italian. They have a nice design with the open or rope design all around and petite roses and flowers on the rims. The smaller piece is a basket with pink and yellow roses. The bowl has pink roses and blue flowers.. There is some surface crazing, teeny fleabite chips and a couple chips to the leaves and flowersas I show. Perfect anywhere in your home in your shabby chic, French country, Paris Apt, Jeanne d' Arc Living style, or romantic cottage decor. Measurements are about 5" wide and 5" tall for the basket and 9" by 3 3/4" for the bowl.. THIS IS A COLLECTION OF 24 WATCH FACES IN DIFFERENT SIZES, SHAPES AND COLORS. Clocks and watch faces always look awesome in a decor. This is for all 24 watch faces. They are different brands, including, Elgin, Bulova, Hamilton.Baylor, Waltham and Mignon. There is fading, minor dirt, paint loss wear and scratches on them. The backs have the little pin points and none have the hands. Perfect for projects, jewelry making or just display in a group, like I show. Measurements are about 1/2" to 1 1/2" for most of them. THESE ARE 8 LITTLE PETITE VINTAGE NAME PLACE HOLDERS WITH CHERUBS. How sweet are these? They are metal silver plate. There is a fancy little oval base with a cherub lying down on each one. It has the original silver paint with a little chippy paint, discoloration and wear. Some of the bottoms have the original sticker that says Japan. You could use them as name place holders, for business cards, or just as decor items in your home. This would be stunning in any shabby chic, romantic cottage Farm House or French Country home. Measurements are about 2" by 1 1/4" and 1" tall each. 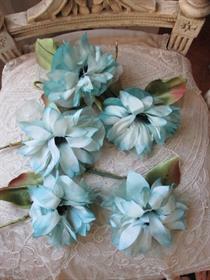 WHAT AN EXQUISITE COLLECTION OF FIVE OLD VINTAGE AQUA MILLINERY FABRIC FLOWERS! These are older of good quality. They have the stems that are wrapped with some of the wrapping tape worn off. The flowershave soft floppy linen or silk like petals. The are soft, and would probably open up more with some steam. There are minor stains and wear. It is so hard to find this gorgeous shade of aqua blue with white. They would look so pretty on a vanity, to dress up a dress form or statue, in a glass case, or just sitting a couple around to add a touch of romance in your shabby chic, French cottage, Victorian or romantic cottage d�cor. Measurements are about 4" each for the flowers only. The stems are about 4" long each. THIS IS JUST EXQUISITE! 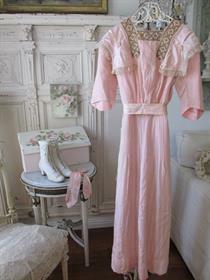 IT IS AN OLD ANTIQUE VICTORIAN EARLY 1900'S DRESS THAT IS PINK SILK WITH GOLD METALLIC TRIM. This was a Sunday or Garden Party dress that was hand made. It is well made. The fabric looks like silk and it is also lined. It is the most gorgeous shade of pink in a very pretty style. Along the top it has beautiful gold metallic trim and lace on the collar. It has a removable belt, that is torn at the ends and with no hooks. There is another little trim piece from the pink fabric, that I'm not sure where that went. PLEASE NOTE THE CONDITION. IT IS FRAGILE WITH SOME DELICATE TEARS AND RIPS, AS I SHOW. THERE IS SOME TATTERED FABRIC, AND LITTLE PIECES OF THE FRAYING COMES OFF A LITTLE WHEN HANDLED, FROM THE INSIDE. THIS IS MOSTLY ALONG THE TOP SHOULDERS, THE COLLAR AND THE INSIDE, AS I SHOW. THERE ARE SOME UNDERARM STAINS ON THE INSIDE. THERE IS ALSO MINOR WEAR. THERE ARE NO ODORS. THERE IS A SMALL STAIN AT THE BOTTOM BACK. This was either a Garden Party dress that was worn to the Sunday afternoon garden parties or a wedding party dress. SORRY, THE DISPLAY VALET I SHOW IT ON IS NOT INCLUDED AND NOT FOR SALE. Measurements are about 47" long in length. The waist is about 26" to 27" . 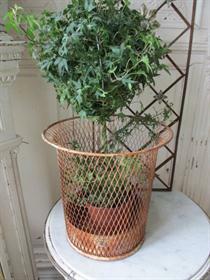 THIS IS FABULOUS AND IS AN OLD VINTAGE METAL WIRE BASKET OR WASTEBASKET WITH A GREAT SHAPE AND PATINA! This is an older metal and wire basket with a wonderful shape and very nice size. It is very well made It is a strong basket that can be used for many things. It originally was a wastebasket. It has a metal bottom and lower inside border. It has a perfect rusty, chippy patina that is time worn. What a great look this has. Great in any shabby chic, romantic cottage, Victorian or French country home.. Measurements are about 12" tall by about 12" by 12" at the top and 9" wide at the bottom. It weighs about 3 pounds. SORRY, THE PLANT IS NOT INCLUDED. THIS IS A GORGEOUS OLD ANTIQUE QUILT TOP THAT HAS ABOUT 8,610 TINY SQUARES THAT ARE HAND STITCHED TO CREATE THIS POSTAGE STAMP QUILT TOP. This is probably from the 1930's with many different cotton fabrics and feed sacks. The colors are beautiful. The squares or pieces are actually rectangle pieces that are 7/8" by 5/8" each when sewn. Along the edges, the little pieces have some fraying and the stitching has come loose in some of the edge pieces. There are a few other separated pieces too. There might be a few minor stains. It is from a smoke free home. Perfect in your shabby chic, French country or romantic cottage home. Measurements are about 58" by 79". There are 102 squares one way and 82 squares the other way for a total of 8,610 pieces. THIS IS A CUTE OLD VINTAGE CHILD'S SOFT PINK UMBRELLA THAT IS SHABBY AND TATTERED FOR A GREAT LOOK! PLEASE NOTE THE CONDITION OF THIS LITTLE UMBRELLA. This is an older umbrella with a wood handle and wire frame. The fabric is satin and a gorgeous shade of soft pink. It opens and closes easily. It is missing some of the fabric, and the rest is torn, fraying and tattered for a charming shabby vintage look. There are some minor stains and dirt. I show how adorable it looks on an old statue or on the cute double pink pigs. Perfect anywhere in your home in your shabby chic, French country, Paris Apt or romantic cottage decor. Measurements are about 16 1/2" wide when open. It is 15 1/2" long. PLEASE NOTE THAT THIS IS FOR THE VASE ONLY AND DOES NOT INCLUDE THE FLOWERS. THIS IS A FABULOUS OLD VINTAGE METAL OR CAST METAL FRENCH PLANTER OR VASE WITH STUNNING DETAILING. This is from France and is stunning with a great look. It is all metal and has a gorgeous shape . It has very nice detailing all around with roses and flowers. It has the original gray or silver paint that is a little chippy, with scratches, some rust and time worn for a nice patina. There are a couple minor chips to the top layer of the paint, as I show at the bottom. This would look so pretty in your shabby chic, French cottage, Victorian or romantic cottage d�cor. Measurements are about 8" tall by about 4" wide at the top and 3 3/4" wide at the bottom. THIS IS A GORGEOUS OLD VINTAGE PLATEAU MIRROR, OR VANITY OR DRESSER DISPLAY MIRROR THAT WOULD BE PERFECT TO DISPLAY SOME OF YOUR FAVORITE ITEMS. IT HAS A WONDERFUL SCALLOPED BORDER ALL AROUND. This is a nice rectangle display mirror that has the cut scalloped border all around for a nice elegant look. It has a felt backing. The mirror itself has ghosting with streaking, scratches spots and wear. Everything looks nicer when displayed on a mirror as I show with some display items, which are NOT included. There are a few minor fleabites along the rim of the mirror. Perfect for your shabby chic, Art Decor, Paris Apartment, French Country, or Cottage decor. Measurements are about 15" by 11". It weighs about 3 pounds. THIS IS A COLLECTION OF 24 WATCH FACES IN DIFFERENT SIZES, SHAPES AND COLORS. Clocks and watch faces always look awesome in a decor. This is a NO RESERVE auction and is for all 24 watch faces. They are different brands, including, Elgin, Gruen, Alpa, Geneva, Bulova, Waltham and Mignon. There is some wear, dirt and scratches on them. The backs have the little pin points and none have the hands. Perfect for projects, jewelry making or just display in a group, like I show. Measurements are about 1/2" to 1" for most of them. THIS IS GORGEOUS! I LOVE THE OLD FRAMES LIKE THIS. IT IS A VERY ORNATE METAL FREE STANDING FRAME. This is an older frame of good quality. All around are the very detailed design that is exquisite. It is metal. It has the original silver paint with some gold showing thru that is time worn, with tarnish and discoloration for a great patina. The front little foot on the right is a little bent, as I show. It has and attached easel and is free standing. It is covered with glass. Great in any shabby chic, Victorian, Antique, romantic cottage or French country home. Measurements are about 5 1/4" tall by 5" wide. THIS IS AN EXQUISITE OLDER VERY OLD METAL FRAME WITH A PHOTOGRAPH OF A WOMAN. This is an older frame of good quality. It is metal or tin. There are two layers of the frame with incredible ornate detailing all around. It is gold with wear, discoloration and a tiny bid of rest. There are some stains on the back of the frame, as I show. It has a nice self easel on the back to make it free standing. There is an old photo black and white of a woman wearing a long dress. It is covered with glass. Great in any shabby chic, Victorian, Antique, romantic cottage or French country home. Measurements are about 7 3/4" by 5 3/4" for the frame. The photo or opening is about 4" by 6". THIS IS SO COOL AND IS A 15' 7 " LONG ZIPPER IN A GREAT SHADE OF GREEN. I have had these before and they always sell, so I was happy to find this one. It is a very long unused gold metal zipper on green binding like material. You could roll it up and display in a cabinet or use on an old dress form, as I show in my pictures. THIS IS FOR THE ZIPPER ONLY. Measurements are about 15' and 7" by 2" wide. THIS IS AN AWESOME OLD METAL AND WIRE BASKET OR WASTEBASKET WITH A GREAT LOOK. This is an older wire basket or wastebasket that looks so good in any decor. It has a metal bottom and a nice criss cross pattern to form the basket. It is a copper goldish in color with some color variation and paint loss and minor stains. It is not perfectly formed. Measurements are about 10 1/2" tall by about 12" wide at the top and 8 1/2" wide at the bottom. THIS IS A FABULOUS OLD WOOD MODEL SHIP, OR BOAT OR FERRY THAT WOULD BE AWESOME IN A NAUTICAL DISPLAY. I really don't know too much about the old model ships, so please email with any questions of anything I might have left out of my description. This is an all wood model ship that was hand made to resemble the ferry used in Norway to move vehicles and people. It has a Danish flag and an old railroad car in it. It has the title Mommark hand painted on it. The red flag has a small crown and the letters DS below the crown. 3 of the strings to the back mast are broken. One of the strings to the front mast is broken. Strings are missing on 2 of the lifeboars. It is missing one lifeboat and one of the lifeboat supports is broken off. There are 2 hard plastic painted figures attached to the ladder and deck. It looks as if there were 3 other figures, but they are missing. There is a removable Lionel boxcar inside. It has the original paint that is a little chippy and time worn. It is still an incredible old find with a great decorative look or perfect for the collector of ships and boats! Great in any shabby chic, Victorian, Antique, romantic cottage or French country home. Measurements are about 11 1/2" tall by about 18 1/2" long by about 5" wide. It weighs about 4 pounds. THIS IS A SWEET LITTLE VINTAGE METAL TRINKET OR JEWELRY BOX. This is an older metal box with four shapely little feet. It has a gorgeous embossed design all around and on the lid. There is a handle at the back of the lid. It is the old gold paint that is a little chippy and time worn. The lid opens up and there is no lining on the inside. Please note that the back hinge looks like it was replaced or repaired at one time, and it could be part of a bobby pin in its place. Perfect anywhere in your home in your shabby chic, French country, Paris Apt or romantic cottage decor. OMG Old Vintage CEMENT DOG PUPPY STATUE BOSTON TERRIER Red Collar Rare Find! OH MY GOSH! THIS IS FABULOUS AND SUCH A RARE FIND! THIS IS AN OLD CEMENT DOG OR PUPPY THAT IT A BOSTON TERRIER OR BOSTON BULL TERRIER THAT IS WEARING A RED COLLAR. How cute is this little cement statue! POODERS, MY KITTEN JUMPED UP TO BE IN THE PICTURES. SORRY, SHE IS NOT FOR SALE!! This is an older piece of good quality. He is sitting up in such a cute pose and with the most adorable face. He is cement and weighs about 15 pounds. He is a nice smaller size, so he could be set on your mantle, on a shelf or table, or on the ground. He is wearing a painted red collar and has the old original black and white paint, that is now chippy and peely with paint loss for an awesome patina. PLEASE NOTE that there is a piece of chipped cement at the top of his ear, and on one of his feet, as I show. Great in any shabby chic, Victorian, Antique, romantic cottage or French country home. Measurements are about 13 1/2" tall by about 8" deep and 6" wide. He weighs about 15 pounds. .